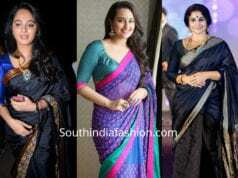 Vidya Balan attended an event wearing a cotton saree paired with full sleeves blouse. Gold earrings from Sakshi Jhunjhunwala and an updo rounded out her look! 6 Easy Tips To Look Slim In A Saree! !